Durban – KwaZulu-Natal municipalities have to cut water usage by 15% or there will be no water in the province by the end of 2016, KwaZulu-Natal Co-operative Governance and Traditional Affairs MEC Nomusa Dube-Ncube said on Tuesday. In addition, the agricultural sector would have to reduce water use by 50%, she told reporters in Durban. The levels of most dams in the Umgeni Water system had become extremely low, threatening the eThekwini, Msunduzi, uMgungundlovu, and Ugu municipalities. Due to the lack of water in these two dams, all the municipalities had been directed to reduce water use by 15%. 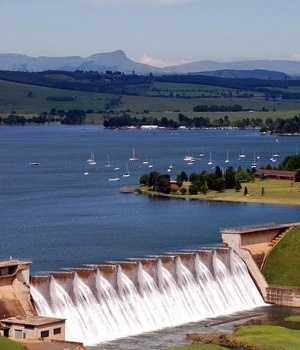 The Midmar Dam was the key source of water supply to Msunduzi, uMgungundlovu, eThekwini, and parts of Ugu. Before the end of the week, all municipalities had to present the department with their plans to achieve the 15% reduction. Dube-Ncube said the restriction had been approved by the Department of Water and Sanitation. Once gazetted it would become mandatory. She said there had been a slight increase in the water levels in the Hazelmere Dam following about 70mm of rainfall over the past three weeks. As of February 29, the dam was at 35,11% capacity. While this was a slight improvement, it was not enough to ease the 50% water restriction in the surrounding water supply area of approximately 400 000 people. More than R600 million had been spent in response to the drought, she said. An emergency transfer scheme constructed through Umgeni Water, which cost R34 million, to alleviate the effects of the drought on the Hazelmere system had stabilised the level of the dam to about 30%. The level of Ixopo Dam was 21,06% as of February 29. Dube-Ncube said the province was looking at various interventions, such as water harvesting from streams flowing into the sea and ensuring that new housing developments had rain capture tanks. The province had started using desalination to convert sea water into potable water, particularly for the coastal municipalities, she said. – Inanda Dam 79,23% (94,08%).